Dads who are looking for an enjoyable way to use their parenting skills to boost kids’ chances at success need only pick up a book. A large body of research suggests fathers and mothers who read aloud with their little ones can nurture a lifelong interest in books as well as improving their academic performance. Reading is also a great way to spend quality time together, whether you are single parenting or sharing the responsibility. 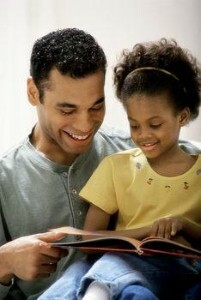 Most kids love the opportunity to curl up with dad and hear one of their favorite stories read aloud. According to nonprofit literacy organization Reading is Fundamental, there are a number of parenting skills that can be employed to help encourage children to read. For example, seeking material closely aligned with your kids’ interests can be a good motivator. In other words, if your daughter is obsessed with dinosaurs or your son with pirates, make sure you choose books on these subjects when it comes time for your nightly bedtime story. The group also suggests using movies as a way to pique children’s interest in a particular book. For instance, you may have already noticed that kids who love Harry Potter are eager to read, see or listen to anything related to the boy wizard. The library can be a great reinforcement for your parenting skills when it comes to igniting children’s love of the written word. The majority of libraries offer story times on a weekly or biweekly basis – this could provide the ideal opportunity for a father-child bonding activity on a weekend afternoon. According to a recent study by Hooked on Phonics, 82 percent of parents with kids under 9 say they read a book out loud to their children on a daily basis. If you are not already among this group, you could be missing a priceless opportunity.